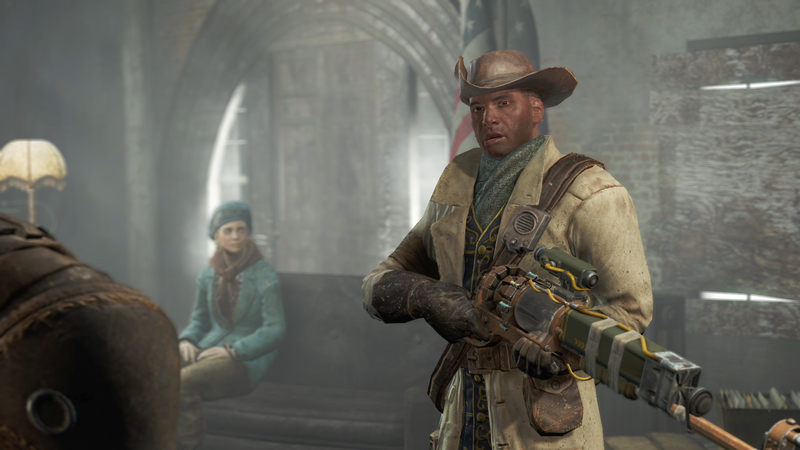 I’m only about 11 hours into Fallout 4 but it’s grown on me more than I expected it to. What I’m saying is that I didn’t think I’d like it as much as I did: It has some things I don’t like, it’s buggy and at one point the narrative didn’t sync with what I’d done earlier but I’m enjoying it. I’ve taken on Super Mutants at a Brotherhood of Steel armoury, traded gun fire with synthetic humans in a hideout and see strange two-headed cows carrying supplies. The Wasteland is a strange, strange world. It’s set in what’s left of Boston. I didn’t like Fallout 3 that much. In fact, I don’t remember playing much of it at all. It didn’t help that I had no idea how the VATS system worked or how deeply involved the RPG side could get. I gave up. I don’t regret that. It didn’t grab me so there was no point playing it. Fallout 4 seems different, though. It seems lot more accessible than F3, but maybe that’s just because I’m more open-minded about the series now and am taking time to play it. I don’t have the time to sink 72 bajillion hours into it, neglect my family and be chained to my PC (I”m playing on PC) all hours – I have a job to go to – but I’m playing an hour or so each night, so I guess you say I’m hooked. I’ve met some interesting people along the way and I’ve tinkered around a little with the base building, too, and yeah, it’s fun. Actually, it could be the most engaging part of Fallout 4, even if Bethesda hasn’t really told people how to get the most out of it. I don’t like the fact that it doesn’t take long for my character’s pockets/backpack/inventory to be full: The game constantly telling me I can’t run because of it and it’s buggy at times. During one mission, after I got into an elevator, my AI companion suddenly appeared beside me after the doors had closed. Then I managed to push him through the side of the elevator just by nudging him. I know people know Bethesda games are buggy, I hear people saying that all the time but is that acceptable? Should we accept the game in that state? I know Fallout 4 is a huge game – hours and hours and hours long – but Bethesda just seem to get a Get out Jail Free card sometimes for the buggy nature of its games just because of the sheer scope and magnitude of them. People are saying Fallout 4 is Game of the Year material. I don’t know yet. If you’d asked me six hours into my play through, I would have said “Nope, it’s not Game of the Year for me”. Now, I’m not so sure. I’ve played a handful of really good games this year so I’m not picking that one yet. I’m going to keep plugging away at Fallout 4. I want to explore more of the Wasteland, scavenge more useless stuff, and take out Super Mutants in my Power Armour. I want to meet more interesting characters like Nick Valentine. Oh, yeah, about the Power Armour. You find it quite early in the game (I’m sure that’s not a spoiler), which I think kind of takes away the mystique of the whole thing. Someone told me that it took hours in Fallout 3 before you were even ready to use the Power Armour. In Fallout 4, your almost handed it on a plate during an early mission. Yes, the Power Armour is cool (until you run out of power core juice) but come on, Bethesda, let people work a little harder to get it, huh? I like the fact that you can customise your armour at special workstations and craft weapon mods and stuff. That’s really cool. Oh, hey, wait: I’ve just found a screen shot I took of me wearing Power Armour. I’m in the sky. On an airship owned by the Brotherhood of Steel. 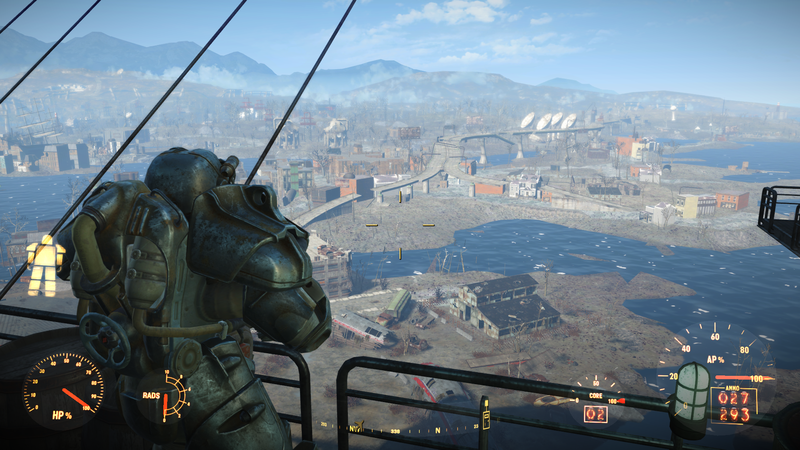 So the long story short, so far, is that I’m liking Fallout 4. Whether I’ll still be enamoured in another 10 hours time, I’m not sure. I’ll keep you posted. I’m glad you mentioned the power armor because it bugged me too. I felt like I had cheated or it was a mistake. I actuality wanted to explore more without it because the experience is quite different n terms of movement and feel. Plus the protection from rads it gives you makes things a lot less scary and easy to deal with such as the brilliant addition of acid rain storms.